HAPPFACTORY & Kaiju One Infamous “BLOJOBOT series” has taken a turn! The Darkside has aroused! oops, we mean risen. Star Wars fans look away you may look at Darth ‘n’ Yoda in a different light from now on, HA HA HA HA. Just check out all the poses and accessories below. KILL me now. 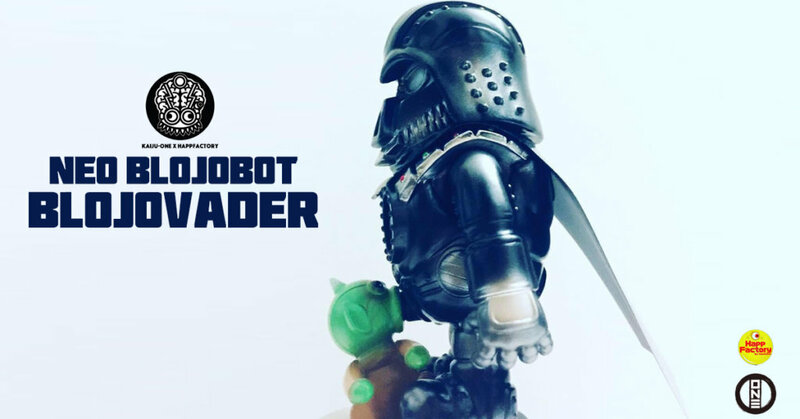 KAIJU ONE and HAPPFACTORY Now Proudly Present their latest 5 inch and 1 inch soft vinyl toy figure set:- THE NEO BLOJOBOT SET（ BLOJOVADER & BLOJOBABY YOGA) ! Lottery Sales will start from 13 Dec 2018 ( NOW ) to the end of 16 Dec 2018 ( Hong Kong time )! Winner will be informed by 18 Dec 2018. The figures will come with two Magic Bullets which have many hidden gimmick to play with. Item will be shipped out by 22/24 DEC 2018. Results will be sent to winners by 18 Dec 2018 through email. Winners qualification will be cancelled if there is no settlement within 3 days upon announcement. Is that a tease of a TROOPER! ! ! ?